President-elect Trump nominated Betsy DeVos for Secretary of Education. DeVos is a billionaire and an education activist from Michigan, and she is known as a strong proponent of school vouchers. She was chairwoman of the American Federation for Children (AFC), which is a leading national advocacy organization promoting school choice. Fordham Institute compiled some quotes from Betsy DeVos on choice and K-12 education. Doug Harris, the director of Tulane University’s Education Research Alliance, penned an op-ed in the New York Times that compares New Orleans’ charter school performance and regulation to Detroit’s. Harris says the DeVos nomination should worry anyone who wants to improve results for children, as DeVos helped design the effort in Detroit, which did not have the needed regulation and accountability. Education Week offers a reality check for both sides of the school choice debate, pointing out the challenges that anyone pushing for large-scale reform will face. Peter Cunningham of the Education Post says charter schools are working for children and parents, and he offers suggestions for how to change the charter school narrative to counter misinformation and confusion. 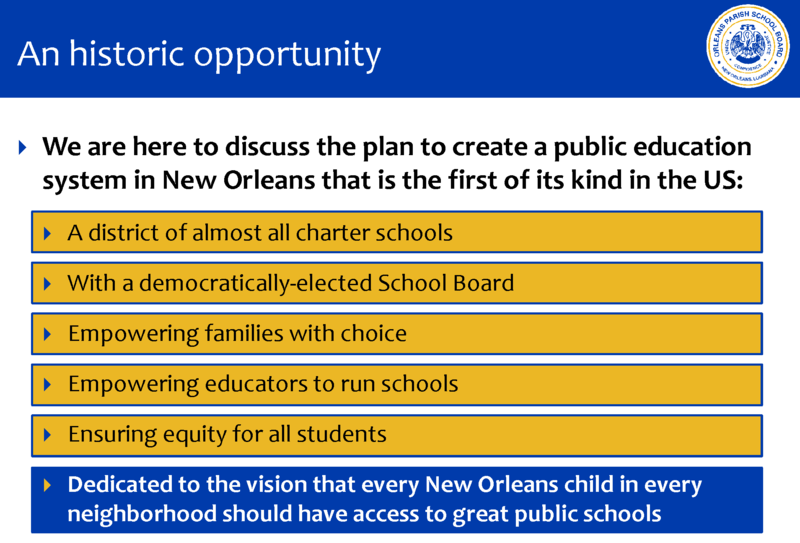 The Orleans Parish School Board (OPSB) is moving forward with a shared vision and platform for New Orleans schools. Five incumbents have retained their seats. Leslie Ellison, Woody Koppel and Nolan Marshall Jr. defeated their challengers in the recent election, and John Brown and Sarah Usdin won unopposed. Two new members join the school board: Ben Kleban and Ethan Ashley. All seven members of the board have pledged their support for a series of goals and action items developed by Forward New Orleans Public Schools (FNOPS). The FNOPS platform covers eight different commitments: to expand high-quality, high-performing schools; serve students equitably; ensure equal access to schools; enforce school autonomy with accountability; act as a responsible resource manager; engage in system-wide strategic planning; collaborate to implement best practices; and promote academic excellence and equity for all public school students. The state has released the 2016 School Performance Scores. Performance has improved. The District Performance Score for New Orleans (OPSB+RSD) increased 1.5 points after three years of no change. New Orleans is only one-tenth of a point away from receiving a B letter grade. While performance has improved, New Orleans did not keep pace with other districts. Our ranking went down two spots from last year – from 41st to 43rd. Our schools were challenged to improve with the new, higher standards; 8 schools went up a letter grade, and 16 schools went down a letter grade. The District Performance Score (DPS) is the most comprehensive measurement of school and student performance. The DPS for New Orleans includes all students, all tests, and all grade levels for OPSB and RSD (including students that attended schools now closed). New Orleans’ DPS went up 1.5 points, from 83.4 to 84.9, the first change in three years. New Orleans received a C letter grade again this year, but we are now just one tenth of a point away from a B. New Orleans is ranked 43rd out of 69 districts, down two spots from last year. Download the 2016 District Performance Scores for New Orleans Schools (xlsx). In New Orleans, interventions typically targeted very low-performing schools, and students attended better schools afterwards. Elementary students in New Orleans saw the most benefit, with affected students not only catching up to their peers in the comparison group, but surpassing them. High school interventions in New Orleans boosted graduation rates for affected students by 20 percentage points. High school students in Baton Rouge saw no positive impact after closures and fared worse in takeover schools, probably because affected students ended up in lower performing schools. 25 to 40 percent of New Orleans’ academic improvement since Katrina can be attributed to school closures and takeovers. State Supt. John White released a draft framework for how Louisiana can comply with the federal Every Student Succeeds Act (ESSA), which replaced No Child Left Behind last year. White’s plan includes changes in how public schools are rated, fewer tests, new assistance for persistently struggling schools, and better teacher preparation. White’s draft plan is set for discussion at nine meetings in October and November, including public gatherings and education panels. You can read the plan on the Department of Education’s website. The African-American community is divided over charter schools. This month, the board of the NAACP will vote on a resolution, approved by its members, calling for a moratorium on new charters. Black Lives Matter took a similar position in their first-ever policy agenda. In response, the Black Alliance for Educational Options (BAEO) helped start the Charters Work campaign and sent a letter to the NAACP, signed by 160 Black educators, advocates, lawmakers and religious leaders asking them to reject the moratorium. This group includes Cheryl Brown Henderson, the youngest daughter of the plaintiff in Brown v. Board of Education. The schools would not experience irreparable harm if the new formula was implemented. Changing the formula did not violate the schools’ charter contracts. The judge declined to rule on whether the funding formula had been adopted legally, saying state courts should consider the matter first. Last spring, OPSB and RSD worked together to develop a unified per-student funding formula, an important stage in returning RSD schools to local control. The unified formula emphasizes students with disabilities, with a small extra amount for each gifted student. Lusher and Lake Forest, with their large gifted populations and small number of students with disabilities, will receive less money than they would have under the old formula. The schools say they are considering their options at this time. The Orleans Parish School Board unanimously approved a Unification Plan outlining the return of schools to the elected board. With the adoption of this plan, the school board has embraced a shared vision for the unified school district that builds upon the changes since Katrina and commits to continuing improvement. A locally elected school board will govern a system of schools in a district that is over 90% charter schools, provides school choice for all families, and expressly commits to ensuring equity and recognizing the need for differentiated resources based on student need.